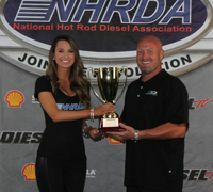 Scott Mckinstry started off his season by winning at the Texas Diesel National in April. Mckinstry then made a game plan to chase after the National points and he attended the next 5 out of 6 events where he placed in the top 5 at each event including a win at Tulsa. As he headed to the World Finals he made a good showing and captured the 2015 Sportsman National Championship.